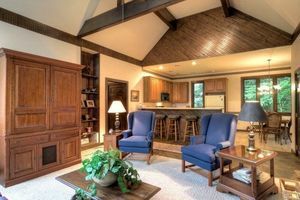 Staging Highlands homes doesn’t have to break the bank. When sellers think staging they think cost. This could mean new furniture, new art, and the like. Staging is, however, a method more than an expense. Staging is preparing a home for fresh eyes, showing off spaces in a Highlands home for sale. Some people hire a professional staging company, others do it on there own. Others rely completely on their Highlands REALTOR for input and advice. Regardless of your choice you should know that staging a home does not have to be expensive. The first step of staging is cleaning. Cleaning includes washing a home inside and out. This could also mean a fresh coat of paint. Of course arranging furniture is another important part of staging. This does not, however, mean you need to buy new furniture. This could mean simply pulling out some pieces to put into storage. The idea is to arrange furniture to maximize your space, making rooms appear as roomy and functional as possible. Click here to read “Infographic: How to Stage a Home on a Budget” from House Logic.